Error is inevitable in all human endeavors, but when the undertakings are engineering feats of enormous proportions, the smallest mistakes may have devastating consequences. 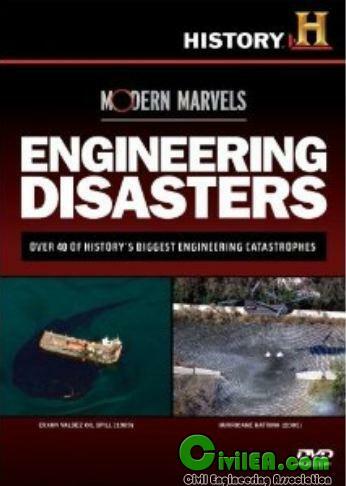 From the Exxon Valdez disaster to a nuclear meltdown at a secret government facility, to the devastating effects of Hurricane Katrina, MODERN MARVELS chronicles over 40 of history s most devastating catastrophes and reveals the lessons learned from each one. In 18 thrilling episodes, HISTORY CHANNEL dramatizes the world s most notorious engineering failures, using state-of-the-art special effects to investigate not only what went wrong, but what can be learned from these spectacular disasters. The catastrophes recounted led to the creation of Superfund sites for the cleanup of toxic waste; improved safety standards for cars, planes, and ships; and new techniques for building roads, bridges, and buildings that will withstand nature s most destructive forces. Dark clouds with silver linings, MODERN MARVELS: ENGINEERING DISASTERS presents the tragic, yet invaluable, handmaidens of technological progress. Finally, what I was waiting for: a large collection of case studies (18 episodes in total; at least two disasters in every episode - sometimes as many as six) taken from a large variety of engineering areas. As a chemical engineer and as an instructor, I found this collection very interesting, full of different "case studies" and lessons to learn in a very amusing way. - New Orleans: Hurricane Katrina. - The fire at Las Vegas MGM Hotel. - The collapse of Seattle's Lacey V. Murrow Floating Bridge. - The flaw that grounded the first commercial jet. - An entire lake and the surrounding land are sucked into a Louisiana salt mine. - The Ford Explorer/Firestone rollovers. - The fire on the Piper Alpha offshore oirlig. - Computer errors that brought the world to the brink of accidental nuclear war. - The explosion of a jet-fuel plant in Nevada. - The Union Carbide explosion in India. - A devastating flood in China that killed 145,000 people. - Denver baggage system nightmare. The only drawbacks are that the DVDs come with no closed captions and no subtitles. Thanks HC. Many of the major engineering disasters of the past century are covered. Each episode provides about 5 disasters and during the 8-10 minutes is provided the effect (disaster), the cause and the solution. The dvd menu lists each disaster, so one can go quickly to the disasters of their interest. The episodes included are #4 through #20, plus Hurricane Katrina is provided as a bonus single disaster episode. Which begs the question, what happened to episodes #1, #2, and #3, as they are not in this set? These early three episodes were generally an overview containing a wide number of disasters in brief detail. I suspect, since these episodes were so good, A&E expanded the series to provide much greater detail and limit each succeeding episode to just 5 disasters. This set also needs an index of every disaster, either on the dvds, or with a paper insert. I loved the menus as they are so simple and easy to follow, without dumb pictures cluttering the screen. This has been one of my best DVD purchases; I highly recommend it. I bought this for my boyfriend who is an engineer and he loves it, and so do I. I was very surprised and intrigued with the variety of engineering disasters that were presented along with the footage. Some of the best ones I've seen so far were the salt mines (the footage of the barges being sucked towards the whirlpool was unbelievable), the Love Canal, and many of the oil rig disasters. I also learned that underground salt deposits make great natural propane storage tanks. In each episode there are multiple stories not just one or two; it is definitely worth the money.